If you read my previous post you know that today is my 2nd blogiversary of blogging at The Eco Chic. My first giveaway for you is some really cool Crayon Rocks! I’m super excited to be able to award THREE winners for this giveaway so continue reading and see why I love these awesome crayons. I don’t get to write about it much but my lifelong passion has been art. I use to paint a lot as a kid and through college; oil paints and acrylics. Unfortunately our house doesn’t have room for me to keep my studio set up so I don’t pull out the paints very often. I do get to share my passion with my son though. He’s always enjoyed drawing and coloring with me. Crayon Rocks are eco-friendly crayons that are great for young kids who are developing their fine motor skills. Most of us probably have a box full of those other crayons so what makes Crayon Rocks so eco-friendly? Traditional crayons are made with paraffin wax and pigments. I didn’t realize that parafin is made of kerosene! Crayon Rocks are made in America using American-grown soy beans. They contain natural soy wax and all natural mineral pigments. The contain no phthalates either (phthalates are used to increase the flexibility of plastics and is bed for the environment and your health). I wish I had these Crayon Rocks when Big B was smaller and learning how to color and write. 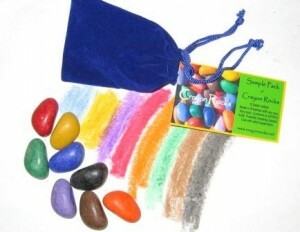 Their unique rock shape encourages kids to hold the crayons like a pencil thus developing their fine motor skills. The colors are rich and they are even more fun than regular crayons. With Crayon Rocks you can smudge them more like oil pastels which allow you to create some really cool techniques. Big B was excited to take his cute little Red Velvet Bag of Crayon Rocks to school with him this year. Another quirky tip…Crayon Rocks don’t have any paper wrapping so your kids won’t leave that waste all over your house when the peel off the paper. Why do they do that anyways? Yes, they are slightly more expensive than traditional crayons but that’s because of the process required to mold Crayon Rocks into their unique shape. Win Your Own Crayon Rocks! That’s right, you can be one of three lucky winners to receive a set of Crayon Rocks. One set of each size will be given away. Yep, you heard me right! One winner will win a Treasure Bag, one winner will win a Red Velvet Bag, and one winner will win the Just Rocks in an eco-box Crayon Rocks! To enter leave me a comment below telling me one interesting thing about Crayon Rocks or the owner, Barbara, that you learned from the Crayon Rocks website (hint – About Us section has lots of info!). 2. Facebook Fans! If you aren’t one already become one….AND…post a picture on my wall of your current crayon stash! Leave me a comment below telling me you completed this task. 3. Twitter Followers! If you don’t already follow me…follow me! AND…post a picture of your current crayon stash and a tweet about this giveaway! Must include @TheEcoChic and a link back here. Leave me a comment below telling me you completed this task. 4. Purchase any of the sets of Crayon Rocks from their website and earn 5 bonus entries! Leave me a comment below telling me you made a purchase and what you bought. Good Luck and Draw, Write, Smile! I learned that childern should hold their first writing tools with their thumb, first finger and middle finger. I left a comment on your giveaway blog post! I became a fan of your facebook page but Ethan is too young to have any crayons yet so if I win the rock I’ll take a pic and post that! I learned that they are wonderful for special needs children and are being used in classrooms. These are wonderful! Eco Chis love this product especially since crayola crayons are made from kerosene and since most little children experiment first by putting crayons in their mouths. I like the shape, seems like they would not break as easily and would be easier for the little fingers to hold. I have a 10 month old daughter so no crayon stash yet except the ones I bought in college during the back to school sales so we would like to try these because we are in the beginning stages of crafts and most of all we like that these crayons are eco-friendly and little people friendly. All natural no toxins and MADE IN THE USA BABY!!!! It was encouraging to know that she was inspired by Handwriting without Tears. We have used that book to help my nephew with his writing/language skills. My son has just started to draw – I am thrilled to find out about these. I learned that children with cerebral palsy, autism, developmental delays and various forms of learning disabilities have tested Crayon Rocks in the classroom. That’s wonderful. I love that these were inspired by Handwriting Without Tears. I worked as an SLP in a preschool for several use and we loved that program–so did the kids! I would have loved to have these crayons then! use thumb, first and second fingers in a tripod grip. I just discovered your site, and was ordering the 20.00 classroom pack for my art room. The original site in CA will not allow UPS to deliver somehow, and I will try again for my paypal is ready…but your site is awesome, and so funny that I missed the ECo giveaway. Enjoyed reading several items… thanks. That crayon rocks looks really great. Really wonderful for children. The only think that I'm worried about this type of crayons is they look like a candy. If there is no proper monitoring your kids might swallow them. That crayon rocks looks really great. Really wonderful for children. The only think that I’m worried about this type of crayons is they look like a candy. If there is no proper monitoring your kids might swallow them.